French astronomer Jean Louis Pons observed and recorded a comet in Leo on June 12, 1819. Its orbit was not determined at the time. Freidrich August Theodor Winnecke unknowingly recovered the comet in 1858. Using several observations from its 1858 appearance, its orbit was calculated. Its orbit was determined to be 6.37 years. The path was recognized as being similar to Pons' comet in 1819. As a result, the comet was officially named 7P/Pons-Winnecke. It was only the seventh comet to have its orbit definitively determined, and like five of its six predecessors it was a Jupiter-family comet. Its aphelion was 5.6 Astonomical Units ("AU") from the Sun, meaning it passed the orbit of Jupiter but not Neptune. It had become trapped centuries or millennia ago in the inner solar system, never to return to the Kuiper Belt. It has been a fairly reliable comet to observe since its appearance in 1869. It has been unobservable for only three orbits. Pons-Winnecke is considered a near-Earth comet. 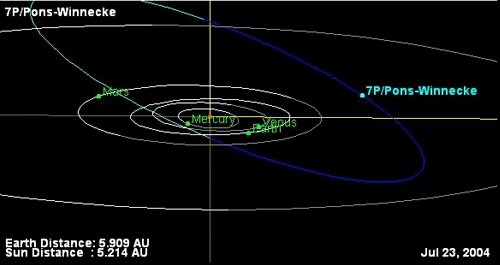 According to the Minor Planet Center, on June 26, 1927 Pons-Winnecke passed .0394 AU from Earth. That’s a little more than fifteen times the average distance between Earth and the Moon. Two orbits later, Pons-Winnecke’s 3.2. mile (5.2 km) wide nucleus came within .107 AU of Earth on July 1, 1939. The 1927 pass was the sixth closest pass to Earth by a comet in known history. At the time, it reached an apparent magnitude of 3.5, which made it easily observable to the naked eye. Pons-Winnecke is thought to be responsible for the Bootids meteor shower in June. After its close pass in 1927, there were estimated to be 500 meteors an hour. The last perihelion of Comet Pons-Winnecke occurred on September 26, 2008. The next perihelion will occur on January 30, 2015. It will be the first of several comets in 2015 to reach perihelion.